A good friend gave me an Incase 12″ carrying case for Christmas once a upon a time, and it quickly became one of my favorite things. It was solidly constructed and had generous padding for protection for my iBook G4. I loved it. It was the perfect companion. When I finally finished mourning the loss of my beloved Appleton (yes, I named it) last month, I decided it was time to take the plunge and get a replacement. Since it was such an involved investment, I didn’t want to take any chances with Appleton II. I immediately ordered a Speck hardcase (in a rich cranberry), and unfortunately, reluctantly bought this piece of junk because I was too nervous about letting the new laptop hang around a few more weeks without proper protection. 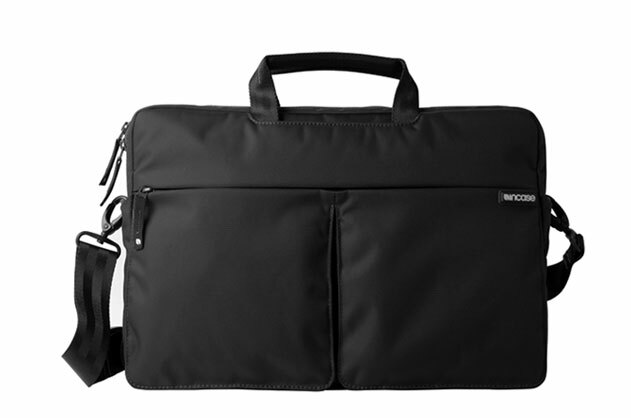 The new nylon Incase bags they now offer use cheaper, thinner material and are poorly made. It was practically a windbreaker for the laptop — with little to no padding. One minor bump later and I’m now the sad owner of a dented laptop. Isn’t the point of this case to protect its contents from minor damage? I mean, minor damage — I wasn’t playing catch with the laptop and I wasn’t doing any rugged traveling or jumping jacks with it. It was a simple, minor bump and out comes a dent. I’m furious. Bottom line, save your money and get something sturdier. Incase, you disappoint me. Back to the store you go. I’ll be testing out different laptop cases and bags and post an update on the winner. I’m thinking Brenthaven next.